NorthEast United FC played host to Bengaluru FC in their first ever semi-final appearance in the Indian Super League at the Indira Gandhi Athletic Stadium Guwahati. It was a historic game for the team from Guwahati as they made their maiden ISL playoffs. Both, the teams came into the game without being in their best run of form as both the sides managed only two wins since Christmas. The game promised to be an exciting encounter as on the previous two occasions when both the sides met during the league stages they produced two mouth-watering clashes. The match started on a bright note for Northeast United as they as they took control of the game from the beginning. Bengaluru FC looked out of place during the initial few minutes. 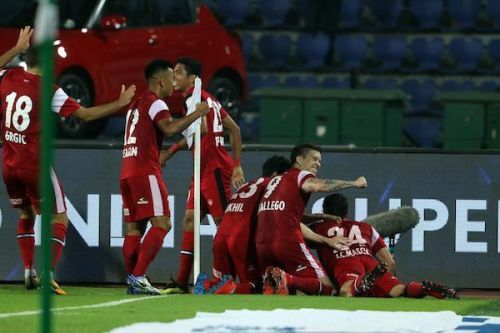 Redeem Tlang gave NorthEast United the lead in the 20th minute by scoring a world-class goal. NorthEast went into the half time break leading Bengaluru FC 1-0. Bengaluru came back stronger in the second half and played a much better brand of football. They finally equalised in the 82nd minute through Francisco Hernandez. Northeast wrapped up the game in added time through a Juan Mascia penalty to give Northeast a slender advantage in the semifinals against Bengaluru FC. The scoreboard at fulltime read 2-1 in favour of the Highlanders. On that note let us take a look at five talking points from today's game. Some teams were bound to be affected by AFC Asian Cup break, and it seems like Bengaluru FC have suffered the most from the break. After the break, they haven't been able to regroup and get their act together. They have managed to win to only two games after the break. One reason could be the fact that Sunil Chhetri, Udanta and Gurpreet have all had a recent dip in form after the Asian Cup. Losing Eric Paartalu to an injury has also affected BFC's performance in the last few matches. Bengaluru FC was poor in the first half especially and was completely overrun in midfield. There seemed to be a complete lack of cohesion in the side, and Carles Cuadrat will hope that his boys can get their act together on Monday.